In the early 90's the graphite plant of CeCe located in Zurich, Switzerland was shut down. The almost 40,000 square meter area became the gathering point and relocation venue for a variety of people. 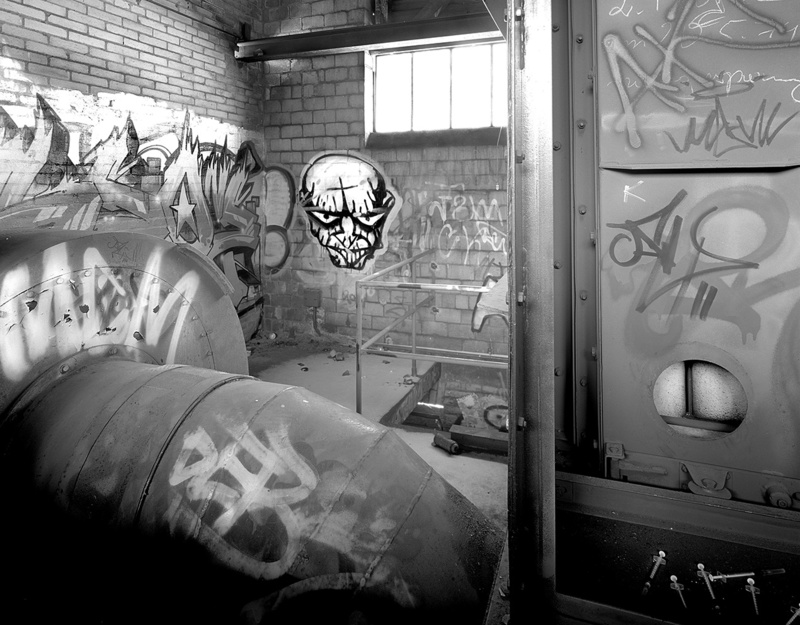 This industrial piece of unused land turned into the internationally known "Hall of Fame" for Graffiti sprayers, but also attracted drug users and was sometimes home to gangs. The construction could not withstand the test of time: walls and ceilings came crashing down; plants and mushrooms re-conquered the long lost grounds and fought their way through centimeters of thick layers of graphite. Garbage, rusty paint cans and all kinds of other scrap metal collected in and around the ruins. The fine black and white prints of "Industrial Morphosis" intend to take the beholder to its own world, a world between mystical fantasies and the merciless harshness of reality. All images of this series were taken with a 8x10" large format camera.